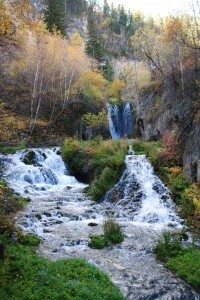 Roughlock Falls Trail is located right behind the Spearfish Canyon Lodge. It is about a 20 minute drive from Deadwood. Take Hwy 85 through Lead to Cheyenne Crossing. Turn North on to Hwy 14A (Spearfish Canyon) Turn at Savoy and the trail starts behind the Spearfish Canoyn Lodge. This is a pretty easy hike, it only climbs 150 feet over the one mile trail. If you don’t feel like hiking, just continue up BHNF rd 222 for 1 mile and you’ll be right at Roughlock Falls. Check out my video of the Falls.